Mills of Buckingham County: Slate River Mills | slate river ramblings . . . .
Over the years, many saw and grist mills operated in Buckingham County. Some lasted through multiple owners as was the case in my Chambers family. Chambers Mills was established by George Chambers and left to his son, George Chambers, Jr., then bought by Samuel D. Holman, who sold to William Oslin. When Oslin’s Mill was washed out in 1899, it was never rebuilt. In the mid-1930s, less than a dozen Buckingham mills were surveyed for the Virginia Historical Inventory, yet we know more were standing and in operation at the time, including Payne’s Mill in northern Buckingham. Some of the mills surveyed were only ruins, including Slate River Mills, also known as Hocker’s Mill. According to WPA field worker Rosa Garnett Williams, the original was one of the first water-turned mills in the county, built by the Hocker family in the early 1800s. It burned c.1905. 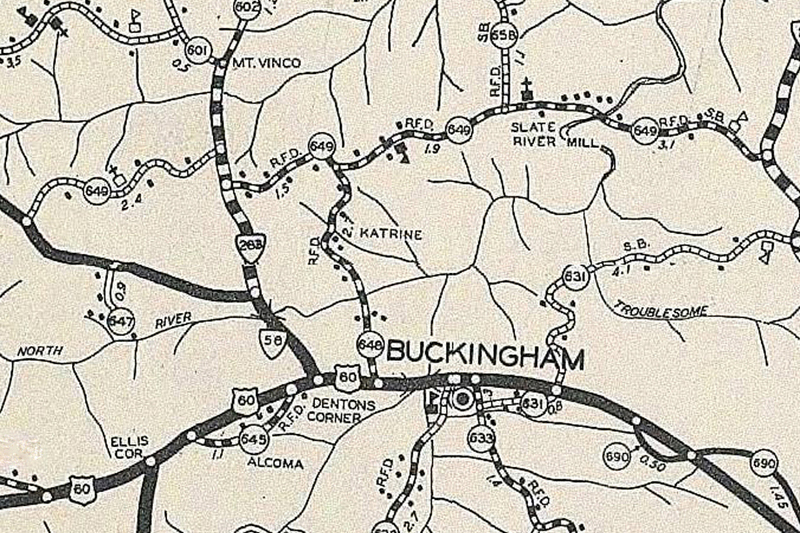 The WPA-era map (above) shows “Slate River Mills” on Slate River, almost due north of Buckingham Courthouse. Mrs. Williams offered directions to Slate River Mills as follows: go south of Dillwyn for 1.9 miles on Route 15, then 3.3 miles north on Route 20 and then west for 2.5 [?] miles on State Route No. 649. Click here to read about the elaborate mill built at Curdsville. Slate River Mill, Revised | slate river ramblings . . . .